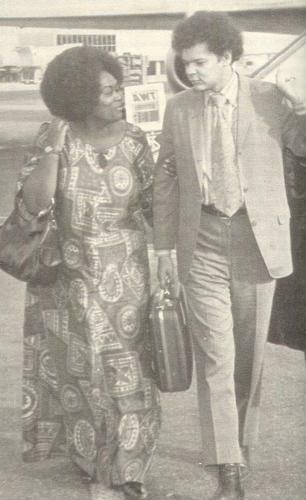 Beginning in the late 1960s, Ruby Duncan led the Welfare Rights Movement in Las Vegas, Nevada. She and her group, the Nevada Welfare Rights Organization (NWRO), brought the Federal Food Stamps Program and the Special Supplemental Nutrition Program for Women Infants and Children (WIC) to poor people throughout the state. In 1971, the group, joined by Rev, Ralph Albernathy, Jane Fonda and George Wiley, president of the Nation Welfare Rights Organization (1966–1975), marched on the Las Vegas Strip shutting down casino operations including Caesars Palace. The initial movement morphed into Operation Life (1972–1992), a non-profit, anti-poverty organization that created the first library in the black Westside community in Las Vegas, organized a medical clinic for children, formed a jobs program, established a drug and violence prevention program, and provided many other needed services. Duncan was born near Tallulah, Louisiana, and migrated to Las Vegas in 1952. Her first home was an abandoned motel with no running water. Left with little financial support for her growing family after being divorced and hurt on her job in the kitchen of a popular casino, Ruby applied for Aid to Dependent Children (ADC) at a time when funds could be cut off if a late night search of a recipient’s home resulted in evidence of a male’s presence. This lack of respect coupled with a sudden drastic reduction in benefits led white, black and Latino women to organize. Ruby was elected president of new Nevada Welfare Rights Organization. The fledging group was trained by George Wiley and given legal opinions by a group of young attorneys working for Legal Aid. Ruby Duncan, Mary Wesley, Alversa Beals, Emma Stampley and Essie Henderson, among others, were arrested many times for protest activities such as the eat-in at the Stardust Hotel where children who had not eaten meat in a while enjoyed steak, lobster, and prime rib. The well known Shell Oil heiress, Maya Miller, funded many of the organization’s trips to Carson City, the state capital, where Duncan learned to lobby the state legislature, became active in Democratic Party politics, and eventually traveled as far as Russia espousing women’s rights. Currently, Ruby Duncan is still receiving honors for her work on issues regarding the poor. She has been proclaimed a Distinguished Nevadan and has received honorary degrees from the University of Nevada, Las Vegas and from the Community College of Southern Nevada. David, one of her seven children became an attorney because as a small boy, he wanted to be sure he could keep his mother out of jail. Her other children are Ivory, Georgia, Ronnie, Kenneth, Sondra, and Roy. Annelise Orleck. Storming Caesar's Palace: How Black Women Fought Their Own War on Poverty (Boston: Beacon Press, 2005); Oral Interview with Ruby Duncan conducted by Claytee D. White, February 12, 2007.